Supra (literally meaning table-cloth) is very much alive and is found on a daily basis in cities as in villages. Spread out before you, you will find a superb range of meats, cheeses, vegetables more often than not organically produced, and often at high altitude amid pure mountain air. Matsoni (Georgian yogurt) and the many varieties of cheeses from sheep, cow and goat’s milk are the products of these deep green pastures. As the ‘Tamada’ or toast-maker raises a glass to ‘friendship’ look down the table at the array of aromatic foods covering the surface. 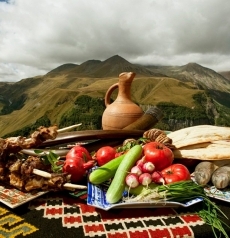 Georgia’s rich and savory cuisine is the natural extension of a fertile, mineral-rich landscape fed by the pure waters of the Caucasus Mountains. Due to the antiquity of the culture here it is hardly surprising Georgia has developed such a strikingly original cuisine. Not only is it a perfect accompaniment to the rich viticulture there, they make a point in showing it off to their guests in “Supras”. Most of their food is organic, and the ingredients from our incredibly varied cuisine profit from the mild climate that provides fresh vegetables for three-quarters of the year – and we have the best Tomato’s you’ve ever tasted. Numerous aromatic herbs give their dishes an uncommonly exotic aroma. Rich in walnuts, pomegranate, vegetable pates, organic fresh meats, wild herbs and love of garlic, their cuisine provides a superb accompaniment to the endless supply of fine wine. 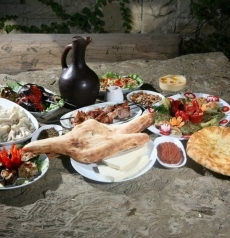 Georgia’s ancient and venerated tradition of hospitality extends to the table as well. Georgian toasting is a thing apart; it is at the very center of their culture, nowhere is it so elaborate, eloquent and inclusive. The role of tamada, the toastmaster, is an exquisite art form in itself. A tamada must be a philosopher-poet, a wit and jokester, an orator and social commentator, and even a singer who effortlessly improvise an engaging atmosphere of camaraderie and convivial pleasure. A certain pattern and pace must be maintained so that periods of relative quiet and reflection juxtapose with the general joviality and energy of a feast. Toasts, however, are not simple declarations; they are expected to be speeches mixed with mirth, spoken verse and insight. Toasts are usually made with wine, toasting with beer is an insult to the one toasted. 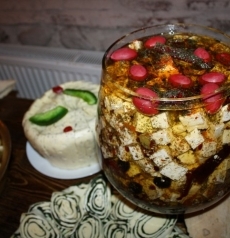 Georgians are very generous with their wine, but since toasts are the only time you are supposed to drink your wine, they have many toasts (they have always been practical people). In fact, they will use just about anything as an excuse to toast, especially during IWINETC 2013! So get used to your family, your country and friendship and your character being toasted! “Georgia’s ancient and venerated tradition of hostility extends to the table as well”…..You probably meant “hospitality” rather than hostility, didn`t you? I love Georgian Supras. Great food, wine, and cha cha.